Vivian by Wig America ~ From the Valentino Collection, the Vivian by Wig America is an easy to wear look that you can take full advantage of. Short, tousled layers of hair create a look you can wear and be comfortable in. Wispy bangs sweep across the forehead to perfection. The randomly flipped ends are all over in the back, and help to complete the overall style. A monofilament cap has many features you'll grow to love each time you're wearing the Vivian wig. Ultra light, the cap won't wear you down. Heat and moisture can be released easily with the ventilation, and discomfort won't ever become a problem. Soft, synthetic fibers, create natural looking hair that looks and feels just like your own. 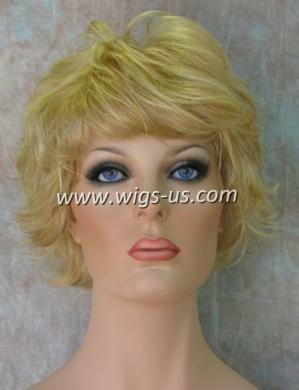 With the Vivian by Wig America women everywhere can own a hassle free look that won't require long amounts of time styling. Place it on, and walk out the door. It's always that easy with the Vivian.